New Firmware Available for the N6700B, N6701A, and N6702A Modular Power System Frames. 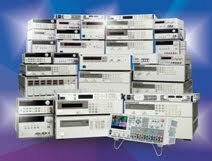 I recently posted a new firmware file for the N6700B, N6701A, and N6702A mainframes to the Agilent website. You can access the new firmware at: http://www.agilent.com/find/N6700firmware. The latest firmware revision is D.01.09. There are two new measurement features that I wanted to highlight. These two new features are External Datalogging and Power Measurements. The other feature that we added to a few of our modules was the ability to measure power. We can now measure power on the N676xA, N6781A, N6782A, and N6784A modules. Why is it only on these few modules you ask? That is because these modules have two measurement digitizers that allow it to measure both voltage and current at the same time. Since power = voltage * current, you need to have a simultaneous voltage and current measurement to get an accurate power measurement. That is all I have for today. If you have any questions, please just let us know. One often encountered issue with power supply use is expecting that the current limit will clamp the current to no greater than the set value, only to discover the current initially overshoots when the DUT demands current in excess of the set limit. In some cases the short surge of excess current may be enough to damage a sensitive DUT. Those experienced with power supplies will recognize this as a dynamic characteristic of mode crossover. What is mode crossover? Mode crossover is the transition point between Constant Voltage (CV) and Constant Current (CC) modes. The dynamic response characteristic of mode crossover is an aspect that separates real-world from ideal-world power supplies. To start it will be helpful to review a previous posting on “How Does a Power Supply regulate its Output Voltage and Current?” Here it is shown there are two control loops in most power supplies, one for regulating the voltage and one for regulating the current. Only one is in control at any given time while the other is “open loop”. The error amplifier that is open loop is up against it stops. When load conditions change such that the power supply transitions through mode crossover the open loop error amplifier needs to recover and gain control of the output. In the more common case of the power supply operating as a voltage source there can be a current overshoot during the brief moment when the load increases beyond the power supply’s current limit setting. Conversely, for a current source, there can be a voltage overshoot during the brief moment when the load decreases, causing the output voltage to rise to the voltage limit setting. The magnitude of the overshoot depends on many factors relating to both the power supply and the DUT. Supplementary circuitry usually surrounds the error amplifiers to clamp them from being driven into saturation or cutoff so that they can more quickly recover when needed. Amplifiers are carefully selected for their recovery characteristics. Careful design is required to assure a stable transition between modes during crossover while at the same time minimizing the delay and overshoot. The magnitude of the overshoot also depends on how quickly and to what extent the DUT transitions between loading conditions. Figure 1 shows the mode crossover current overshoot of a 50 volt, 3 amp general purpose power supply, set for 10 volts and 1 amp output. The loading DUT is an electronic load set to transition from no load to 10 amps with a slew of 0.8 amps per microsecond. This loading represented a worst case for all practical purposes. When the load transitions to full (i.e. overload) it takes about 6 milliseconds for the current limit control loop to fully take over and bring the current down. During this mode crossover period the current overshoot plateaus at 5 amps, which is the gross current limit capacity of the power supply. Basically this is the point where the power supply runs out of drive. In Figure 2 the power supply current limit was reduced to 0.1 amps and the mode crossover was again captured. This had an interesting impact on the current overshoot. While the peak current still hit a plateau of 5 amps, the duration of the overshoot was considerably reduced to about 0.5 milliseconds. The reason for this is there was a much larger difference driving the error amplifier’s input, causing it to transition more quickly. The peak level remained unchanged as it is determined by the power supply’s gross current limit capacity, which is fixed. · Try not to oversize the power supply. Be aware that the peak level of voltage or current during mode crossover may be governed more by the maximum voltage and current ratings of the power supply and less by the settings. Using an oversized power supply with its limit set to 5% of its capacity will likely yield a much larger overshoot than a smaller one with it limit set to 50% of its capacity. · If your DUT is sensitive to an overload, include evaluating the response characteristics of mode crossover as part of your evaluation, using realistic conditions that reflect the characteristics of your DUT. Recognizing that there is dynamic response characteristics associated with mode crossover of “real-world” power supplies, and they need to be considered, may save a lot of surprise and frustration later on!